Featuring:Steve Gadd & Rick Marotta(Drums) , Will Lee (Bass), Richard Tee , Don Grolnick and Chris Palmaro (Keys) Alan Rubin, Jon Faddis, Randy Brecker (Trpts), Sam Burtis,Dave Taylor (Bones), Lou Marini, George Young, Lou Delgato & Ronnie Cuber (Saxes). 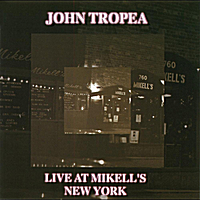 Tropea Live At Mikell's was recorded in 1981. Featuring some of the finest studio and performing musicians on the East Coast. Produced by John Tropea and Will Lee. A very funky, double drummer band of Friends. John Tropea is one of the most admired and highly regarded guitar players of his generation. His playing shows a vast knowledge and respect for the tradition of the instrument as well as an original style that continues to define how the guitar best serves a wide variety of musical styles. He is a musician's musician who attracts the finest players for his own projects. Tropea has written for and played with major recording artists from around the world. In his long career, his contributions to other artist's successes have been numerous, including his solo work with Deodato, (2001 theme), projects with Laura Nyro, Harry Chapin (Cat's in the Cradle), Paul Simon (Fifty Ways), Alice Cooper (Goes to Hell), Eric Clapton (Journey Man), Dr. John, and many others. He is also a composer, arranger, and producer whose vital work is ably demonstrated by his personal projects. Tropea has a deserved worldwide reputation as an artist of quality among both audiences and other musicians. Tropea began guitar studies at the age of 12. His musical education continued at Berklee School of Music in Boston, where he studied jazz guitar, harmony, composition, and big band arranging. Immediately after arriving in Boston, Tropea began playing live R & B and jazz gigs with many different bands in the area, including The Three Degrees. Influenced by Wes Montgomery, Johnny Smith, Louis Bonfa, Pat Martino, and George Benson, it was at this time that Tropea began to absorb those influences into an original style of his own. Also among his mentors at the time were the great B3 organ players Jack McDuff and Jimmy Smith. After Berklee, Tropea recorded and toured with Deodato. Moving to New York in 1967, Tropea quickly became one of the most sought after session players. He soon became a peer among New York's finest studio musicians. As well as world touring, Tropea wrote and produced three critically acclaimed solo albums with TK records. His first solo album "Tropea," was released in 1975, followed by "Short Trip to Space," and "To Touch You Again." With those early recordings and other projects, Tropea formed close musical alliances with other great New York musicians including: David Spinozza, Warren Bernhardt, David Sanborn, Randy and Michael Brecker, Steve Gadd, Anthony Jackson, Don Grolnick, and Richard Tee (Tropea played in The Richard Tee band). During this time Tropea also wrote and arranged music for film and broadcast advertising. With his frequent co-producer and friend Will Lee, Tropea went on to release "Simple Way to say I Love You”, and "Something Old, New, Borrowed and Blues" Live gigs from that era by The Tropea Band at Mikell's, in New York City, remain legendary. Along with his own projects, Tropea currently plays with the Original Blues Brothers Band. Recently, Tropea has formed an astonishing band that not only gives voice to his "standard influences" but also defines him as a player, composer, and arranger of consummate musicianship and exciting presence. "When I was in college at Berklee School of Music, I was introduced to the Hammond B3 Bands and it was a heavy influence in my development. At this time in my life now, it is my passion to continue to play with this format." Tropea's band plays live regularly these days and has produced two CDs, "Standard Influence," and "Standard Influence II/Rock Candy," both "must haves" in any CD collection. Made up of world-class players, this is no pick up band; this is a REAL band that plays with the refined sense of ensemble one finds in the finest string quartet or chamber music group. Made up of: Ronnie Cuber, baritone sax, Clint de Ganon, drums, or Steve Gadd, drums, Anthony Jackson, electric bass, Dave Mann, tenor sax, Lou Marini, tenor sax, and Chris Pa!mar°, Hammond B3; everyone in this band is a virtuoso, yet no one ever over-plays. While the band has a refined sense of time and a compelling groove that makes it impossible to sit still while listening, the arrangements have, at the same time, a transparency that allows the listener in, where all the intricacies become apparent. The sound is always balanced. You hear what everyone is playing. The musicians in this band know how to use space in their playing. And while all the solo playing is creative, musical, and virtuosic, it is the rhythmic component, the sense of accent, the power of the ensemble playing that drives this group to astonishing heights of excitement. The comping, the back up playing, is as vital, as intricate, as interesting as the solo playing integrated with it. Here is a refined group of musicians whose playing complements one another, whose aim is the sound, the quality of the band as a whole. They achieve this goal to the highest degree. The band plays jazz, R&B, and Funk standards, along with original compositions. But each tune is made up of an original, tightly constructed, and sophisticated arrangement. This quality is a delight for the listener and makes an audience eagerly look forward to the next tune and what wonderful surprises that next tune will bring. Don't look for long solos, endless choruses from this band. That is not what they are about. There is no dross here. While the band demonstrates complete understanding and mastery of a variety of musical styles, they play entirely without cliché. And this band knows how to program a set. Offering a wide dynamic balance, The Tropea Band plays with a savvy and wit that is appreciated by its audiences. Continually bringing new elements and surprises with each new tune, they know how to drive a set to an unbelievably energetic and satisfying conclusion. With the respect he has gained from some of the finest musicians playing today, Tropea has been able to put together a group that shares his vision, that continues to re-define venerable traditions, and that makes music together that is of lasting beauty and significance. Tropea has once again gotten back to his live audience, as well as those who follow his recordings, and with this band, he has found his apotheosis.